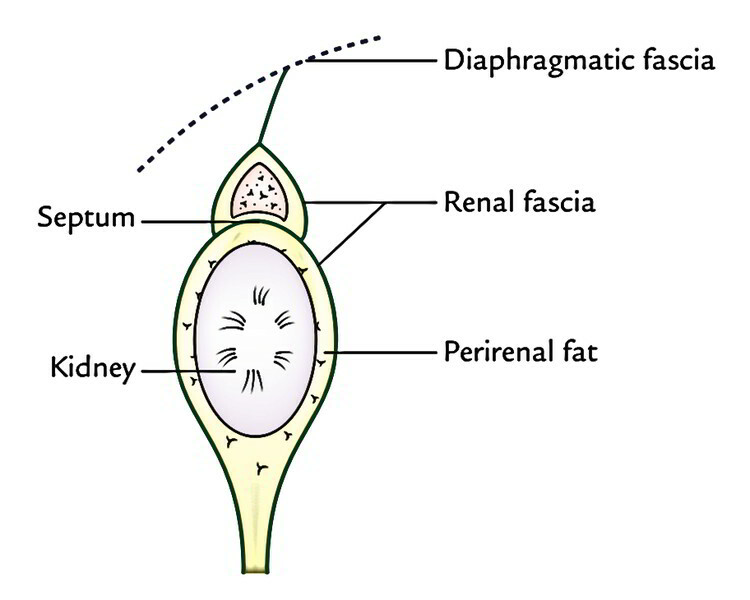 The Suprarenal Glands are a significant pair of endocrine glands which are enclosed in exactly the same fascial sheath as that of kidneys (renal fascia). These are situated on the upper poles of the kidneys. Each suprarenal gland is composed of 2 parts: (a) a comparatively thick outer cortex which grows from the mesoderm (mesodermal lining of the peritoneal cavity) and (b) a central medulla which grows from the neural crest and is equivalent to a group of sympathetic ganglion cells. Commanding electrolyte and water balance. Keeping liver and muscle glycogen stores. The composition of the medulla is of large granular chromaffin cells which secrete adrenaline and noradrenaline (catecholamines). These catecholamines are like those discharged by the postganglionic sympathetic fibres and are kept in great amount in the medulla. They’re readily oxidized to a dark brown colour by specific salts of chromic acid (example, potassium dichromate), a characteristic which makes the renal medulla a part of the chromaffin system of the body. Onto genetically, phylogenetically, structurally, and functionally the cortex and the medulla (of suprarenal gland) are different from every other but topographically they can be quite similar. As a whole every adrenal gland is yellowish in colour, otherwise in section the cortex is yellow and the medulla is dark brown in colour. Accessory suprarenal glands: Small accessory suprarenal glands which may contain adrenal cortical tissue only are typically seen in loose areolar tissue around the primary gland but might be seen in the spermatic cord, epididymis, or broad ligament of the uterus. 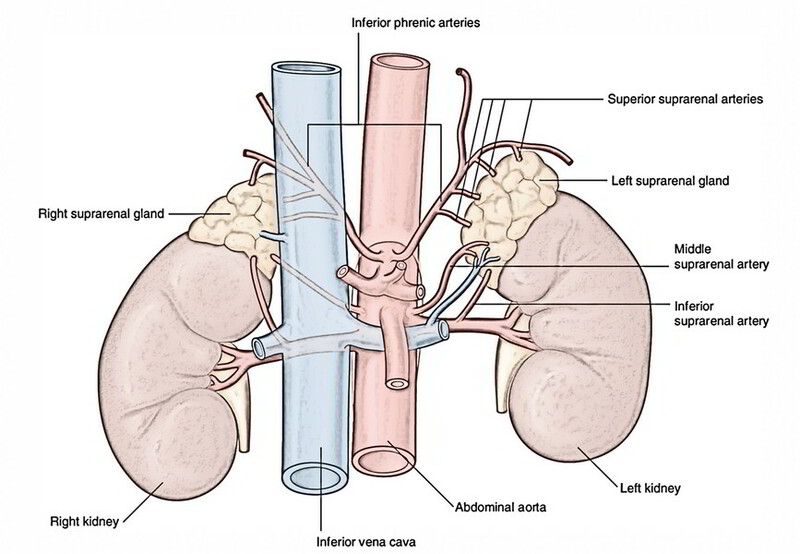 The suprarenal glands are in the epigastric region of abdomen, anterosuperior to the upper part of every kidney. 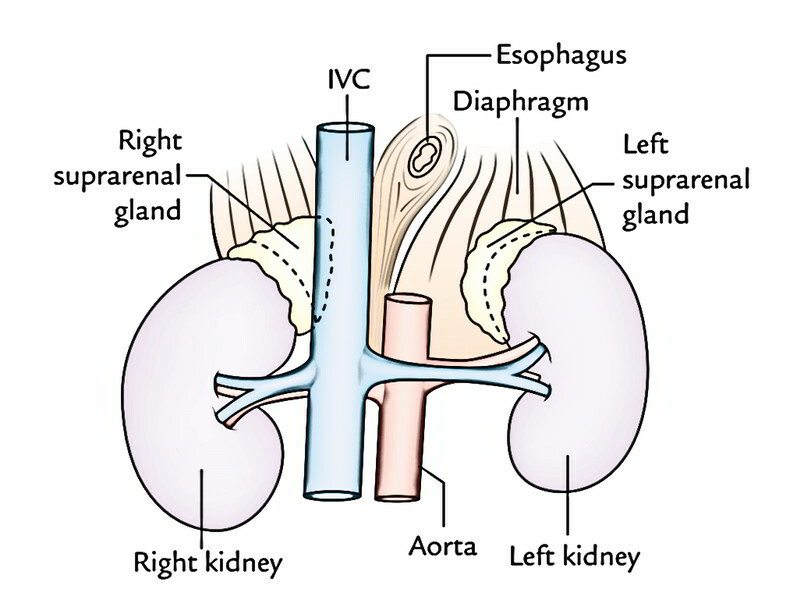 The right suprarenal gland is wedge shaped between the diaphragm posteromedially, the inferior vena cava anteromedially, the right lobe of the liver anteriorly, and the kidney inferolaterally. Superiorly it’s related to the naked area of liver. 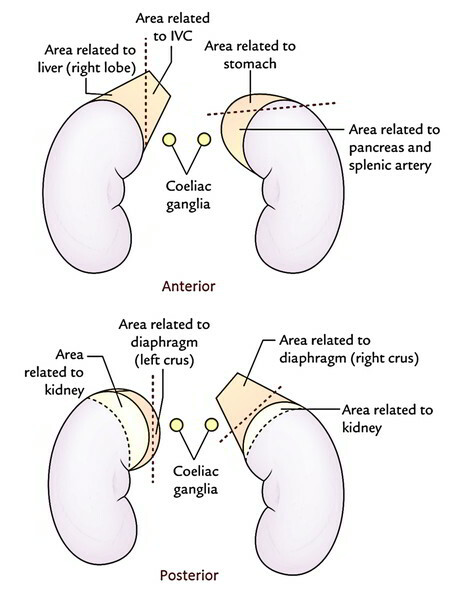 The left suprarenal gland is located between the diaphragm posteromedially, the stomach anteriorly (with lesser sac and pancreas and splenic artery interceding), and the kidney inferolaterally. Every gland is flattened anteroposteriorly. Right gland is triangular or pyramidal in shape bearing a resemblance to a “top hat”. Left gland is crescentic or semilunar in shape like a “cocked hat”. Weight = About 5 grams. At birth the gland is all about one-third of the size of kidney, on the other hand in adults it’s only 1/30th of the size of kidney. Right suprarenal gland: Its base, apex, 2 surfaces (anterior and posterior), and 3 edges (medial and lateral). Left suprarenal gland: Its 2 ends (narrow upper end and rounded lower end), 2 edges (medial and lateral), and 2 surfaces (anterior and posterior). Posterior outermost layer of the right gland is split into upper convex and lower concave parts by a curved ridge. Posterior surface of the left gland is split into medial and lateral regions by a ridge. Anterior outermost layer of the right gland has narrow vertical medial area and triangular lateral area. Anterior surface of the left gland has superior and inferior regions. Hilum: The hilum of suprarenal gland gives development of the suprarenal vein. Its location differs on both sides. In the right suprarenal gland, it’s short sulcus a little inferior to the apex and near the anterior border. From it, the right suprarenal vein comes to join the inferior vena cava. In the left supra renal gland, it’s situated near the lower part of anterior surface and faces anteroinferiorly. 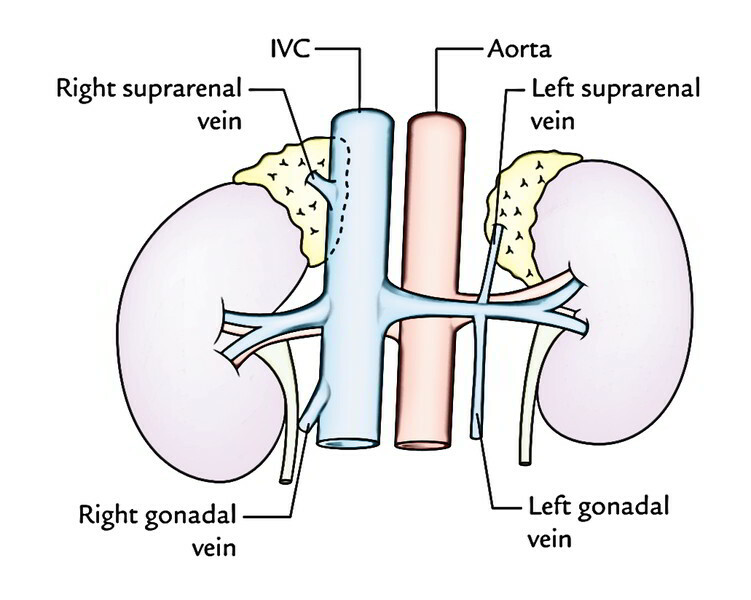 From it, the left suprarenal vein appears to join the left renal vein. Immediate covering of loose areolar tissue consisting of a large amount of perirenal fat. Outer to this renal fascia encloses the suprarenal gland along with the kidney but the gland is divided from the kidney by a septum. Outer zona glomerulosa consists of nests or clumps of small polyhedral cells. Middle zona fasciculata is composed of parallel straight Pillars of large polyhedral cells. Inner zona reticularis is a net of interlacing cords of rounded cells. The medulla includes fibrils or clumps of chromaffin cells interspersed with sympathetic ganglion cells. Chromaffin cells: All these are cells that have affinity for particular salts of chromic acid, for this reason the name chromaffin cells. They grow from neural crest cells. They’re found on posterior abdominal wall near the sympathetic ganglion. Besides adrenal medulla, the other cases of chromaffin tissue are: paraganglia, para-aortic bodies, and glomus coccygeum (coccygeal body). Superior suprarenal artery: A branch of the inferior phrenic artery. Middle suprarenal artery: A branch of the abdominal aorta. Inferior suprarenal artery: A branch of the renal artery. Right suprarenal vein empties into the inferior vena cava. Left suprarenal vein empties into the left renal vein. The lymph drains into lateral aortic nodes. The nerves are extremely numerous. They may be mostly myelinated preganglionic sympathetic fibres originated from splanchnic nerves and are dispersed primarily to the chromaffin cells of the medulla that are homologous to postganglionic sympathetic neurons. The action of the cortex is mainly restrained by adrenocorticotrophic hormone secreted by the anterior lobe of the pituitary gland. A number of clinical circumstances may take place following lesions changing the cortex or medulla of the suprarenal gland. They may be attributable to either surplus or lack of secretions from various parts of the gland. It happens because of chronic insufficiency of cortical secretion. Medically, it presents as (a) muscle weakness and wasting, (b) increased pigmentation of skin, (c) low blood pressure, and (d) restlessness and tiredness, etc. It happens because of hypersecretion of the adrenal cortex. Medically, it presents as (a) obesity including the face (moon face), neck, and abdomen, (b) hypertension, (c) hirsutism, and (d) masculization (virilism) in female and feminization in male, and (e) adrenogenital syndrome in kids. Adrenalectomy (bilateral removal of the adrenal glands) is occasionally done in advanced and inoperable cases of carcinoma breast and prostate. Great care must be taken during adrenalectomy. The suprarenal vein must be ligated before manipulating the gland in order that catecholamines don’t escape in the circulation. 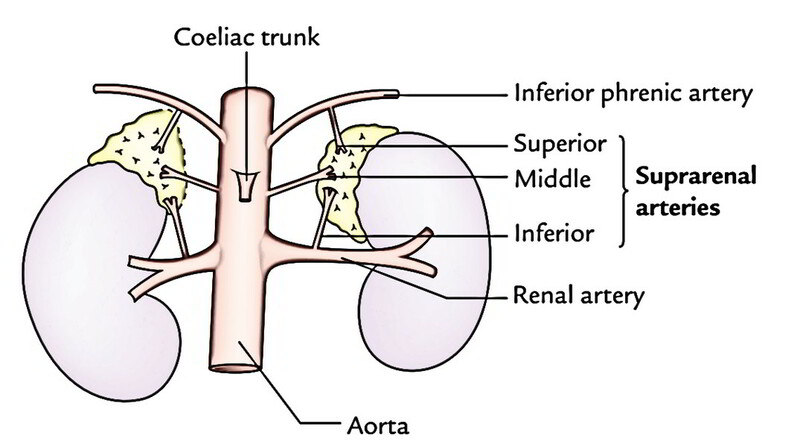 The right adrenal gland is more challenging to method compared to the left because part of it is located posterior to the inferior vena cava. Pheochromocytoma is a tumor of the adrenal medulla. The signs and symptoms are generated because of explosions of epinephrine and norepinephrine. Medically, it presents as (a) paroxysms of hypertension, (b) palpitation, (c) head ache, and (d) excessive perspiration, and pallor of the skin.